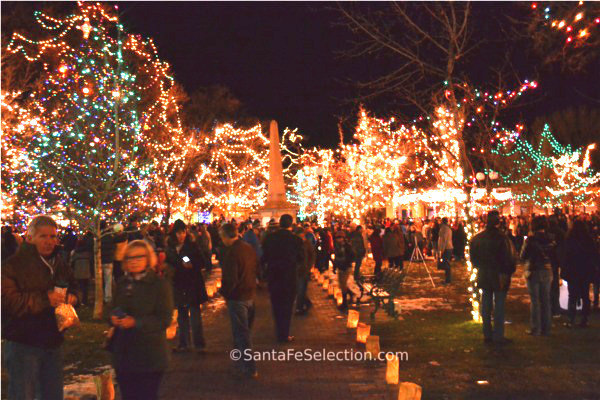 Santa Fe is an ideal place to enjoy the holidays with plenty of fun things to do in November and December – from Thanksgiving to Christmas and through New Year’s. 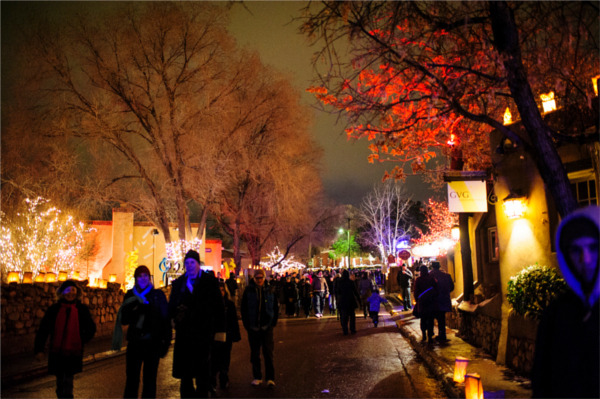 From mid-November it’s easy to get in the festive mood as Santa Fe dresses the part; adobe parapets lined with farolitos, cedar and piñon burning in fireplaces, and the abundance of sweet-smelling spruce trees create an atmosphere of warmth and comfort against the backdrop of the snow-capped Sangre de Cristo mountains. If you’re thinking of visiting, take these few steps first to ensure you make the most of your time. First contact me for your free Mini Guide with three helpful maps and tips on where to eat, points of interest, ideas of things to do, where to shop and more. We will mail it to you (within the U.S.) in advance of your arrival, or have it waiting for you at check-in, if you send us your dates and lodging location via our contact form. Book your lodging well in advance if you can. For the best places to stay, check our lodging categories for great rates and discounts at top hotels, B+Bs, vacation rentals and inns. Check my Weather and What To Pack article for insight on the temperatures to expect and what to bring. If you’re here for Thanksgiving dinner and you’re looking for a great restaurant to enjoy a traditional dinner, or a la carte with themed specials, you’ll find what you’re looking for in our Restaurants category. Many places offer special holiday prix fixe dinners, and have special seating times. You will need to reserve in advance. The ski season at Ski Santa Fe usually starts on Thanksgiving Day and this year, we’re thrilled that is the case (it’s best to check each year as weather varies and may delay the opening slightly). 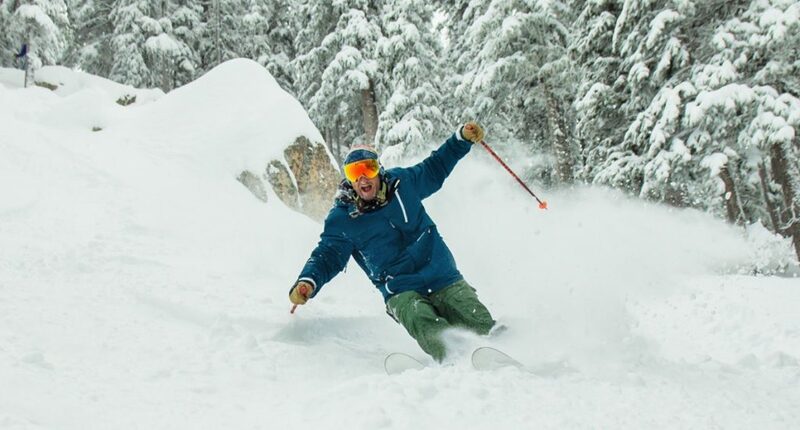 The Santa Fe ski basin is only a short and very scenic 25 minute drive up the mountain and offers a variety of run levels for all ages and abilities. Ski Santa Fe – a skiers delight. On Black Friday, Santa Fe begins its Christmas anticipation. 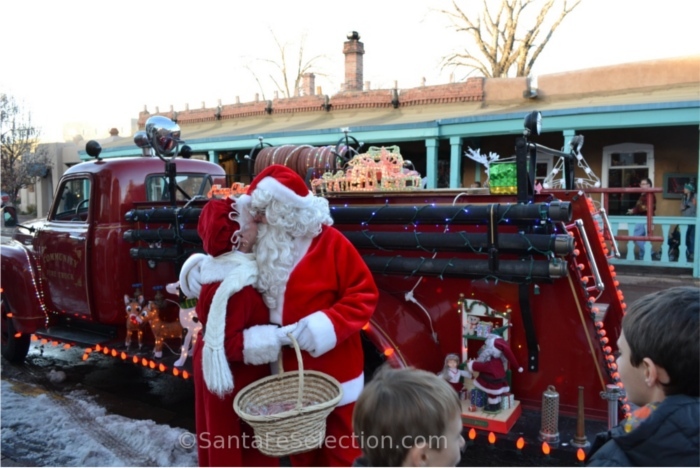 People gather on the Plaza downtown around 3:30 – 4 p.m. to watch as a vintage fire truck parades Santa and Mrs. Claus around the Plaza. Santa will eventually stop and take his seat to greet all the kids clamoring to give him their Christmas wish lists. Just after dark (usually around 6 p.m.), the crowd gathers to watch the brilliant display of Christmas decorations light up the Plaza. Santa Fe’s Plaza Lighting on the day after Thanksgiving. 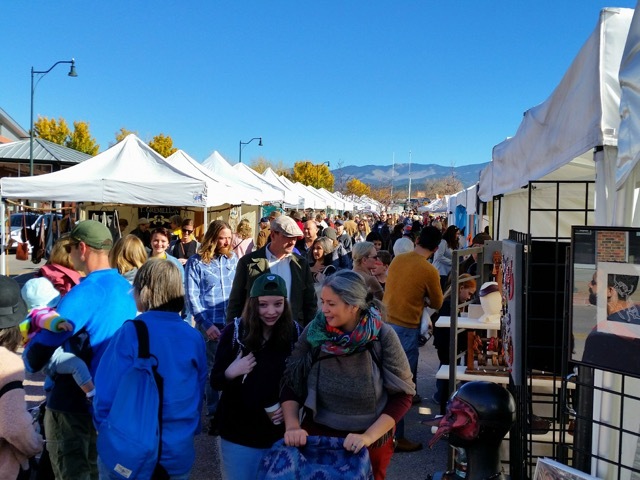 The Saturday after Thanksgiving Day, from 9 a.m. – 2 p.m., you can find wonderful unique holiday gifts at the Santa Fe Artists’ Market at the Railyard. Santa Fe Artists’ Market at the Railyard. The perfect place for the perfect gift buying spree. For more original shopping and gift ideas, visit our Unique Shopping category. You’ll find trusted vendors of everything from authentic Native jewelry, painting, pottery, and weavings, to handcrafted hats, hat bands, belts, cutlery, holiday decorations and much more. And if you’re looking to decorate your home, or find that beautiful piece as a gift for someone special, click here for the best selection of Art Galleries. 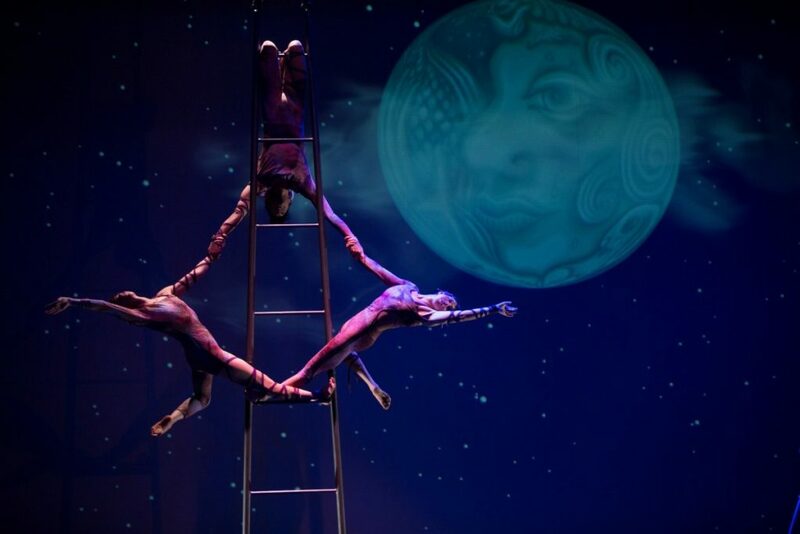 On Thanksgiving weekend from the Friday through Sunday, a Santa Fe tradition for locals and visitors is to see the annual Wise Fool – Circus Luminous performance at the Lensic Performing Arts Center. Talented local performers create a uniquely themed, fun packed show each year, with homegrown aerialists, acrobats, dancers, and a hilarious crew of red-nosed clowns. Circus Luminous is a favorite for all ages! It’s a good idea to book your tickets in advance. Usually, tickets go on sale in early November. Check the Lensic calendar for details and to purchase tickets. Circus Luminous. A fresh show each year draws crowds from near and far. There are also amazing holiday-themed performances from Performance Santa Fe, Santa Fe Pro Musica and more throughout November and December. Check the Lensic calendar for details and to purchase tickets. For a list of fun ideas of things to do with friends and family between the Thanksgiving and Christmas days off, check our Activities categories. You’ll find details on everything from unique outdoor excursions, tours, fly-fishing, hikes, food and wine tours, and escape rooms to holiday-themed cooking classes, art classes, and chocolate elixir tastings and more. Usually, during the second weekend of December (the 7th – 11th, each year varies slightly) the traditional Las Posadas and Christmas at the Palace events are much anticipated. These are free, family-friendly events held at the Plaza and the Palace of the Governors /New Mexico History Museum. Christmas at the Palace happens first. Check this link for this year’s dates. From 5:30pm – 8p.m., this Christmas favorite brings folks together in true holiday spirit, for a visit from Santa and Mrs. Claus, hot cider, live music, and entertainment – in the legendary magical atmosphere of the Palace of the Governors. (The History Museum and Palace of the Governors will close early at 3 p.m. to prepare.) Enter through the Palace entrance at 105 West Palace Ave. The History Museum will remain closed in the evening. Two days later at the same location, The New Mexico History Museum and Palace of the Governors host the long-held Hispanic tradition called Las Posadas. The event starts at 5:30 p.m. and lasts until 7p.m. This is a re-enactment of Mary and Joseph’s search for a place to give birth to the Baby Jesus – and throws in a few devils for good measure. The annual candle-lit procession of Las Posadas travels around the Santa Fe Plaza and concludes in the Palace Courtyard. Stay for carols in the Palace Courtyard, along with cookies and refreshments. Free and open to the public. At the same time in December, usually the second week, the Santa Fe Botanical Garden’s Annual Glow winter lights event begins. Every night (except Christmas Eve and Christmas Day) up to New Year’s Eve, from 5 p.m. to 8 p.m., you can enjoy the unique holiday light display. Children 12 and under are free. Check this link for Glow’s current theme, dates and rates. Around the third Saturday in December there is the Santa’s Village at The Railyard Event. This year it is held on December 15th, from 10 a.m. – 3 p.m. there are many indoor and outdoor activities set up for your family’s enjoyment. Meow Wolf has a presence, along with caricature artists, and there’ll be face-painting, and Santa’s Workshop where you can create your own ornament, or gift. There’ll be food vendors, a holiday movie, mini train rides, interactive model trains, holiday music and carols, and the Santa Fe Artists’ Market and Farmers’ Market and more. From around the 14th of December onward there are quite a few traditional holiday performances that I recommend you plan ahead and purchase tickets for in advance. We locals tend to book early in anticipation of these fun and festive shows. Around the second week of December, (this year, 2018, it is December 15th and 16th) embrace the Holiday spirit and revel in the magic of Aspen Santa Fe Ballet’s The Nutcracker! (click link for this year’s dates, pricing and ticket purchase information). Aspen Santa Fe Ballet’s Nutcracker. A much anticipated event each year. This iconic production is both uplifting and filled with humor and has become a seasonal Santa Fe tradition. With its whimsical twist on the classic story and a cast of over 60 performers, I highly recommend this perfect opportunity to create lifelong memories for you and your loved ones. Tickets go on sale in early November, so be sure to mark your calendars each year so you can get your tickets! Another popular favorite is the Baroque Christmas Series by Santa Fe Pro Musica. Usually held every evening during the week leading up to Christmas with a final performance on Christmas Eve, the holiday atmosphere and nostalgia is in full swing. 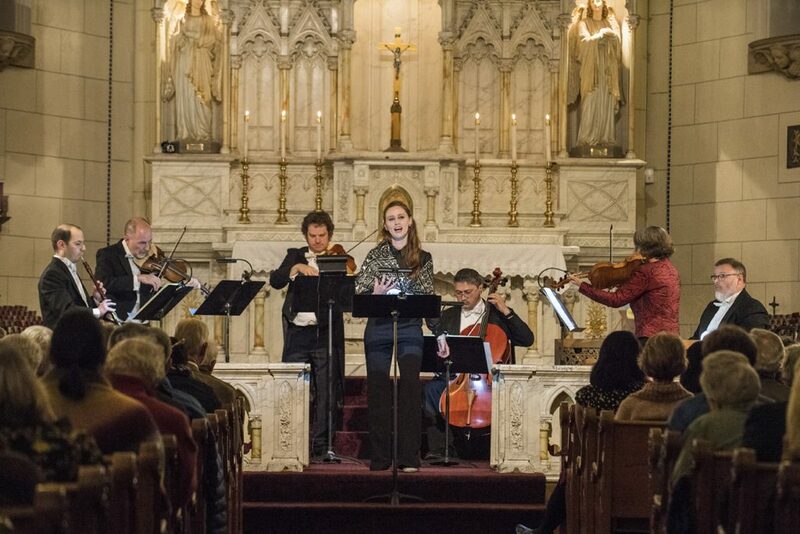 Shows are at 6 p.m. and 8 p.m., when music of the Baroque Masters and traditional carols are performed by well-known musicians and singers in the beautiful, non-denominational Loretto Chapel. Performance Santa Fe always has a special show with top performers that honors the season. This year they have All is Calm: The Christmas Truce of 1914! showing at the Lensic on December 20th at 7:30 p.m. Critics hail All is Calm as “one of the top live events for Christmas in North America” (BBC Music Magazine) and “a classic to be repeated for years to come” (Minneapolis Star Tribune). Check this link for this year’s Performance Santa Fe holiday show, ticket information and schedule. El Farol, the oldest restaurant and cantina in Santa Fe, located on historic Canyon Road offers festive cheer with a jazz dinner show on the two Thursdays leading up to Christmas. You can jive up your holiday and get some swing in your step with Sister Mary and her band of Merry Makers. It is sure to be an intimate evening of contemporary holiday tunes, including the music of Ella Fitzgerald, Kay Starr, Louis Armstrong, Eartha Kitt and more. Seating is at 6.30 p.m. for dinner service. Show tickets are $25 per person, plus cost of dinner from the delicious menu that includes a variety of authentic Spanish tapas and full entrees. Seating is limited, so make your reservations early! (505) 983-9912. On Christmas Eve the holiday spirit continues along Canyon Road for the traditional Christmas Eve Farolito Walk. Its historic sidewalks and alleyways are lined with authentic candle farolitos, which guide the way for hundreds of people walking from bonfire to bonfire, gallery to gallery, sipping hot cider and singing carols. I highly recommend you plan ahead and book your table in advance so you can reach the top of Canyon Road and be welcomed into a cozy atmosphere for the delicious heart-warming holiday food of The Compound Restaurant, El Farol, or The Teahouse. There are also many traditional pueblo holiday events. Check our Pueblo Feast Day Calendar for a list of the Native American pueblos who permit visitors during their many holiday season celebrations from Christmas Eve up to New Year. Check the listings under the months. To ring in the New Year, the place to be is on the Plaza to enjoy what has become the City’s traditional New Year’s Eve on the Plaza Celebration. Festivities begin around 9pm on December 31st. Bonfires, music, and good cheer are in ample supply. Hot chocolate is available for a donation, and food trucks stand by to keep you nourished and happy. At midnight there will be a fun surprise in store. There is no fee to attend, and no alcohol is permitted. 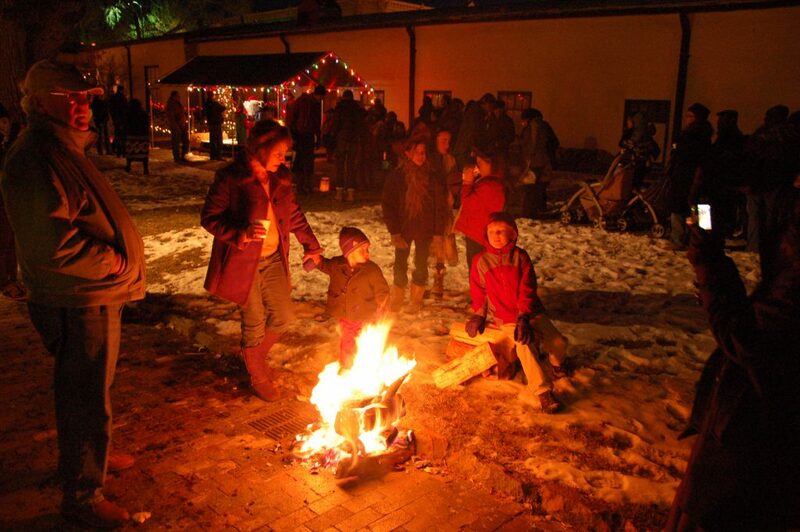 So get packing and bring your friends and family to enjoy a cozy and creative holiday season in Santa Fe, New Mexico. 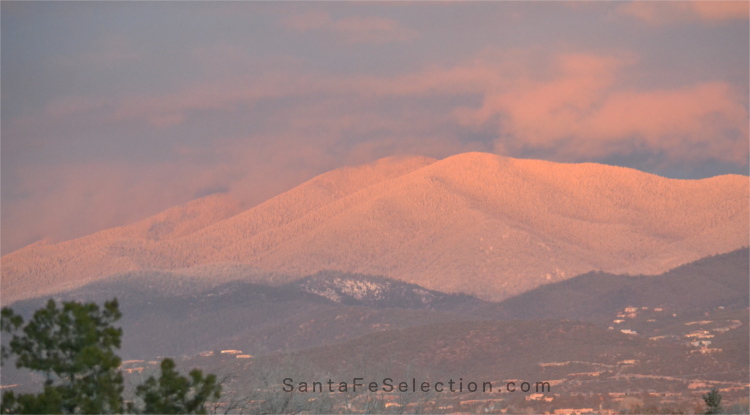 Happy Holidays to you and yours from SantaFeSelection.com Travel Guide & Concierge! If you’d like to receive my free monthly blog articles about Santa Fe, its people, places, history, things to do and more, via email, please send me your request to Maria@SantaFeSelection.com THANK YOU! !